You’ve heard the expression “Silence is golden”, but when it comes to living with an Eating Disorder, silence is anything but. It’s Eating Disorder Awareness Week (EDAW) in Canada. And in an effort to break the silence and help others to feel less shameful of their struggles, I’m sharing my story. If you know me or have visited my website, you may be familiar with the surface of my story, but not the whole story. When I started to become competitive and take Judo a little more seriously, I did everything I thought was necessary to win. I was good at going to practice as often as I should and worked hard at it. I would be hard on myself when I couldn’t perfect a certain throw or groundwork technique. I wanted to be the best! While physically I was ready, my mental fortitude was not that of an elite athlete. The decision to fight my body and force it into submission was easy at first. It was the typical dieting mindset of less calories in, more calories out. My Mom was concerned but I would tell her I had it under control and not to worry. This is what I had to do if I wanted to excel in my sport. The truth was, at that time, I thought I did have it all under control. Then I moved to Montreal, to train with other judokas who had similar goals to mine. My training regimen became more intense and my weight initially dropped by a couple more pounds. “Yay!”, I thought, “this is easy”. But, my body fought back! The increased training meant my body was building muscle, demanding more food supply and I didn’t like it one bit. Why was my body not co-operating with me? I was determined to stay down in weight. And so started the weight cycling, making it harder every time to make the weight. With every judo tournament, came a 6 week plan of severe calorie restriction, excessive exercise and week long self-induced dehydration. The night before weigh-ins you would see me, with countless others, in a garbage bag and sweating it out in the sauna. How was this normal for anybody? 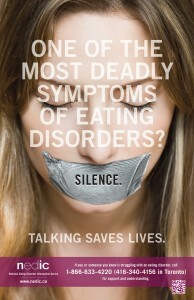 Silence is black when suffering an eating disorder. A big, black, silent hole of shame and despair. I believe it was 1995 when it all came to a head with 2 incidents that are still clear in my mind. The first was the Provincial Championships, a tournament that would decide who would go to Nationals. By this time, I was already quite competent in my purge-binge-purge cycles but my metabolism was messed up. I had to resort to more drastic measures to get my body to make weight. So I decided, the night before weigh-in, to consume a full package of laxatives. The results were scary – curling up on the floor of my sister’s room barely able to move, jittery and not able to sleep. Looking in the mirror, all I could see was the gaunt, skeleton-esque face looking back at me. I wondered how I was going to hide this from my parents, my coach and my teammates. I wore a hoody and tried to cover the sunkeness of my cheeks with blush. I barely made my way to the scale with my heart feeling as though it was pounding outside of my body. And all I could think of was “I hope I make weight, I hope I make weight” and “Good God, how am I going to compete without going into cardiac arrest?”. Luckily for me there was no one else in my weight category and so I was saved the embarrassment of trying to get my body to move. A few months later, I was in BC for Nationals. I tried desperately not to use laxatives for fear of getting caught. But it was still getting harder and harder to make the weight. Once again, I had to take drastic measures. The day before weigh-in, already without anything in my body for several days, I took to the sauna while it was open and resorted to running around the hotel room floors with garbage bags on in the middle of the night. I would run through a pattern of 20 minutes on, 20 minutes off. “No rest, this is my only option”, I thought. The battle was in the weight and had nothing to do with judo, the competition or my Olympic dream anymore. Silence is really black and dark and lonely when you’re starving and purging on the 10th floor of a hotel in the middle of the night. By the time morning came, I literally had nothing left. An hour before weigh in, my coach was carrying me into a homemade sauna in the hotel room. With swimsuit and garbage bags on, I curled myself up on the bathtub floor and allowed the hot water to wash away any possible liquid left in my body. Barely even able to walk. How was I going to even compete? I was escorted to final weigh-in, stepped on the scale where my goals were instantly shattered. I was still 200 grams over my weight category. Not good enough. Not able to compete, the shame in others knowing I couldn’t do it and a $200 fine just highlighted my failures and drove me into a deeper despair. Shortly after Nationals, while no longer competing (but still engaging in the eating disorder behaviour) a dear friend broke the silence. She was brave enough to have an honest and frank discussion with me on her concerns. A subsequent call to Mom and Dad, admitting that I needed help and into treatment and recovery I went. But, in secret, the eating disorder consumed me! Obsessive checking of the scale and pinching of the fat under my chin and on my stomach. The 3am runs alone, in darkness. The lost menstrual cycles and the diagnosis of an underactive thyroid. I was lucky to have the support and get help when I did. I believe all things happen for a reason. And while that was a very dark time in my life, it has brought me to a very good place. A place where I can share my story. A place where I might inspire another judoka/young girl/woman/man struggling with her or his weight, size or shape to no longer force their body into submission. Silence is black when struggling with food and weight preoccupation. But your voice could be the golden light that pulls someone out of that deep dark hole.